Floor Care Tips from Gaetano Hardwood Floors, Inc. Since your hardwood floor is a lifetime investment, caring for it should be a priority. Drawing upon decades of experience in our family business, we were able to develop a hardwood floor cleaner that is versitile, safe and easy to use. The Gaetano Cleaner is formulated for all types of wood floors. Regular dry dust mopping is an essential part of hardwood floor care. A good quality dust mop such as the EasyFloorcare "Soft Mop"(dry) is the most effective tool for cleaning dust and dirt off your floor. To keep your floor looking its best, dry dust mop more often on floors with heavy traffic. Spills and tracked-in dirt can build up and will require more than just dry dust mopping to remove. 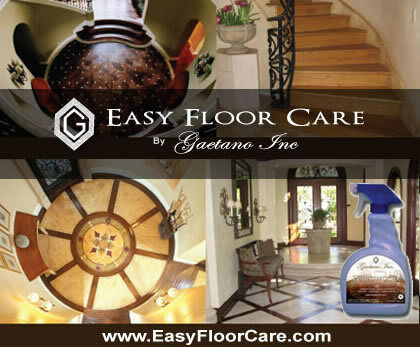 We recommend our Gaetano EasyCareCleaner (available at www.EasyFloorCare.com). Lightly mist this eco-safe solution directly onto one of our microfiber mops. With a back-and-forth motion, our cleaner will loosen the dirt and protect the finish. For spot-cleaning, apply our cleaner directly to the area and wipe clean with a terrycloth towel. Place throw rugs in front of sinks in your kitchen and any doors leading outside where heavy traffic and tracking occurs. Do not do this until at least two weeks after the finish has been applied. Chairs, and any other furniture that is moved frequently, should have CarpetGlides™ floor protectors attached to the bottom of each leg to help prevent scratching and wear. Do not wax the bottom of chair legs.